African-American males represent a sliver of enrollment. More could succeed in engineering if schools understood what it takes to beat the odds. “You’ve already overcome challenges to a certain degree,” Willie Rockward reminds freshmen at all-male Morehouse College, alma mater of the Rev. Martin Luther King, Jr. and other African-American leaders. While too many of their peers are “in jail, in a morgue, or on the way” to one or the other fate, these young men, on average, have earned 3.2 high school GPAs. But steeper challenges await them in the Physics and Dual-degree Engineering Department that Rockward chairs, including two preliminary semesters of “tough math.” And before students enter Morehouse’s 3-plus-2 partnership with one of 14 engineering schools, including Georgia Tech, Rensselaer Polytechnic Institute, and the Rochester Institute of Technology, they’ll take three semesters of physics. Such back-to-basics rigor is one school’s answer to a longstanding, perplexing question in engineering education: Why are there still so few African-American men? While black males account for 5 percent of the college population, they represent just 4 percent of undergraduate engineering enrollment, 3.3 percent of graduates, and 2.7 percent of master’s recipients. A tiny fraction reaches the professional pinnacle. According to the Journal of Blacks in Higher Education, African-Americans represent just 1 percent of National Academy of Engineering members. For Morehouse freshmen and African-American males across the country, reaching college is itself an achievement. Just 52 percent of young black men graduate from high school in four years, less than a fourth enroll in college, and their incarceration rate is seven times that of whites. “We’re losing young black males throughout the educational pipeline,” says James Moore, Distinguished Professor of Urban Education at Ohio State University. Once on campus, many will struggle financially and academically. About 45 percent of Morehouse students and two thirds of black men overall won’t finish in six years. Some bright students who might gain acceptance to elite schools settle instead for less competitive colleges. Those who pursue engineering face a particularly grueling and lonely slog. They often arrive with little exposure to the engineering profession or understanding of what it requires. Inadequate high school preparation requires them to play catch-up with classmates who took calculus or Advanced Placement physics and chemistry. That stretches time to graduation and adds costs. At majority-white institutions, black engineering students find few faculty members and potential mentors who look like them. Lack of high school calculus or AP science courses sets students back but needn’t disqualify them, as schools that recognize and work to correct the problem have shown. “What we’ve found is that students who are able to receive that information [about their poor preparation] without internalizing ‘permanent failure’ have been able to recover from that feedback,” observes Terrell Strayhorn, an associate professor of higher education at Ohio State who directs the Center for Inclusion, Diversity, and Academic Success. Where Morehouse provides extra math and a third semester of physics, Florida A&M-FSU and a number of other programs offer a rigorous pre-engineering summer bridge program. “That’s a milestone for them,” Perry says. It’s followed by a series of introductory courses and math. “If someone gets through, the rate of success is very high,” he notes. New Jersey’s Educational Opportunity Program cushions college entrance for young men like Christopher Sam, who will graduate soon from the New Jersey Institute of Technology with a 2.7 average and a job with Cisco Systems. In high school, he hadn’t gone beyond Algebra II and trigonometry, and his grades “weren’t the best.” He also had attention deficit-hyperactivity disorder. EOP accepts disadvantaged students with comparatively low scores and provides added instruction and guidance. At NJIT, the focus is on acquainting students with what engineering is all about and then preparing them to take Calculus 1-3. The program boasts a five-year graduation rate of 69 percent. It has ended up taking Sam seven years. A high attrition rate among African Americans in STEM feeds low expectations among faculty and advisers. Too often, says Ohio State’s Moore, “people don’t look at African-American males as individuals. They see them as a group.” Strayhorn tells of an adviser who failed to put through a form required to process a major, doubting the student’s staying power. At white-majority institutions, students spoke to researchers of being the last to be tapped for team projects and of instructors who couldn’t fathom backgrounds different from the white-American norm. One student was assigned to develop a software program to research his family tree. His instructor had trouble accepting the result: a program that incorporated his single mother and her unmarried partner’s family. Although the number of African-American males enrolled in undergraduate engineering programs and graduating with a bachelor’s degree in engineering has increased slightly over the past several years, their share of engineering undergraduate enrollment and graduates has declined by half a percent. In one sense Conley was lucky: Several generations of his family had gone to college. If other African-American boys grew up thinking the NBA or NFL were their only route to success, Conley had a father who assured him, “Nerds run the world,” and who asked rhetorically, “Does Bill Gates look like he can dunk a ball?” With his parents’ backing, Conley took advanced classes at a community college, landing at Ohio State with Calculus I and II already under his belt. Students seeking a semblance of family and community at majority-white institutions often turn to formal or informal African-American groupings such as fraternities or campus chapters of the National Society of Black Engineers. Those who ascend to leadership can gain, in turn, “a unique brand of access,” as Shaun Harper of the University of Pennsylvania found in a study of African-American high achievers published in 2008. “Specifically, presidents, deans of students, and other administrators would often invite the high achievers to serve on major university committees to represent the needs and perspectives of racial/ethnic minority students,” writes Harper, executive director of Penn’s Center for the Study of Race and Equity in Education. 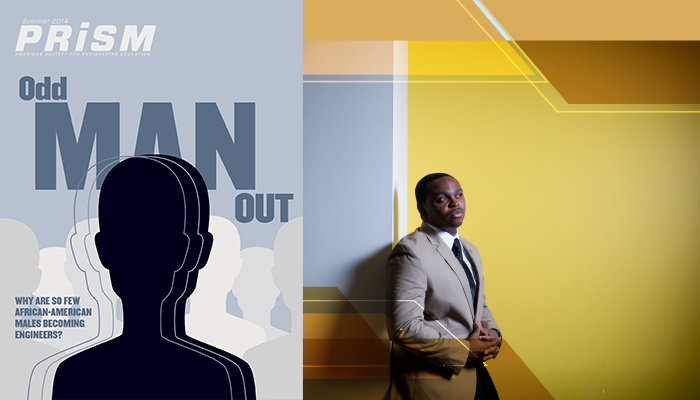 Many students experience an academic crisis of some kind, but for African-American men, financial difficulties and a sense of isolation can compound discouragement and end their pursuit of an engineering degree. In such times, a mentor can make a huge difference. “One thing that got me over the hump was talking to Dr. Howell,” says Christopher Sam, referring to the director of the Equal Opportunity Program at NJIT. “The mentor doesn’t have to look like you; he just has to care about you,” Morehouse’s Rockward tells students, encouraging them to be “pro-active” in identifying a mentor. Corey Baker had mentors throughout Alabama State, including math Ph.D. candidates who tried to goad him into following in their footsteps by pointing out how few blacks were in the field. “They knew how to push my buttons,” recalls Baker, now a doctoral candidate himself at the University of Florida. In turn, he became one of Alabama State’s few undergraduate tutors. He encountered trouble with Calculus III after transferring to San Jose State and then faced what was known as the hardest course in computer science. His D-plus didn’t impress a manager at HP when Baker went to interview for an internship. Then another manager intervened: “Hire him – he’s good.” He knew of the course and the professor’s reputation for rigor. If jobs and internships offer experience and contacts to many students, they represent survival for African-Americans like Lumumba Harnett, an electrical engineering senior at Hampton. “I lost a lot of sleep” early on in college, working nights and weekends at a sports-equipment store, he recalls. Pressure eased when a valued mentor, associate professor of electrical engineering Otsebele Nare, took him on as a research assistant. Harnett discovered he loved research and now has a fellowship for graduate study in radar systems and remote sensing at the University of Kansas. Higher education as a whole, says Rockward, needs to recognize that taking six years to graduate isn’t extravagant. He’s seen students struggle for three years and then – “like whoa, man, what happened?” — something inside them starts clicking and they get A’s. Mark Matthews is editor of Prism. Margaret Loftus is a freelance writer based in Charleston, S.C.